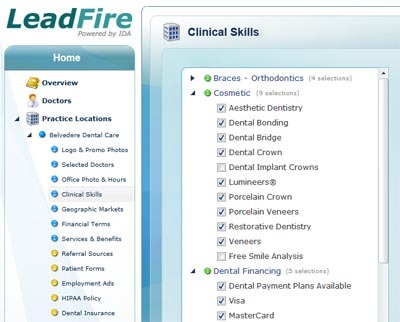 Internet Dental Alliance’s LeadFire 2.0 program focuses on dental marketing for ALL of a dentist’s clinical skills. Our extensive network of national and local dental directory websites can have a major impact on doctors’ search engine rankings. To get the most out of this, clients will need to take a few moments to list their clinical skills. Click the video at right to learn more about listing your Clinical Skills. Here, you should list ALL of the clinical skills your office provides, not just those highlighted on your IDA/LeadFire web portals. Those portals will stay the same. However, you will also be featured on dental directories based on all your clinical skills. To be included in the expanded online directory system, you MUST complete this list of your clinical skills. You will be included in all directories that are consistent with your skills and geography, including national directories for general dentistry, dental insurance, and financial arrangements. You can always opt out of any directories on which you would prefer not to be listed. While you’re logged into your Control Panel, we suggest you also review your practice’s “Services & Benefits.” This is also a great time to update any other information about your practice that may have changed. Our customer service team is available to help you out; give them a call anytime at (855) 435-7675.